What happens when the lady of the house goes shopping and leaves the boys at home on a day off? We go to the Rogue and swing some flies. 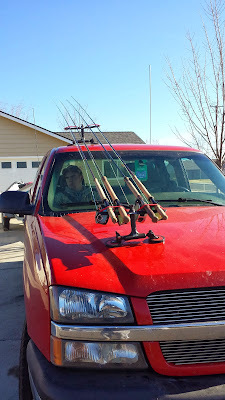 We loaded up the rods and headed to the top of the river to try out a couple of new patterns that I wanted to fish. I took Gage to the top of the run, tied on my prototype fly, and pointed out the rocks to pay attention to. Gage, rolled his eyes and told me,"Dad I know, I'm not a little kid anymore." I thought, ya kid, I would listen if I were you. But, I smiled at Gage, and headed to the next run below. I about made it to my run when I heard, "Dad, Fish On!" I looked up river and sure enough Gage had a nice fish making a good run. 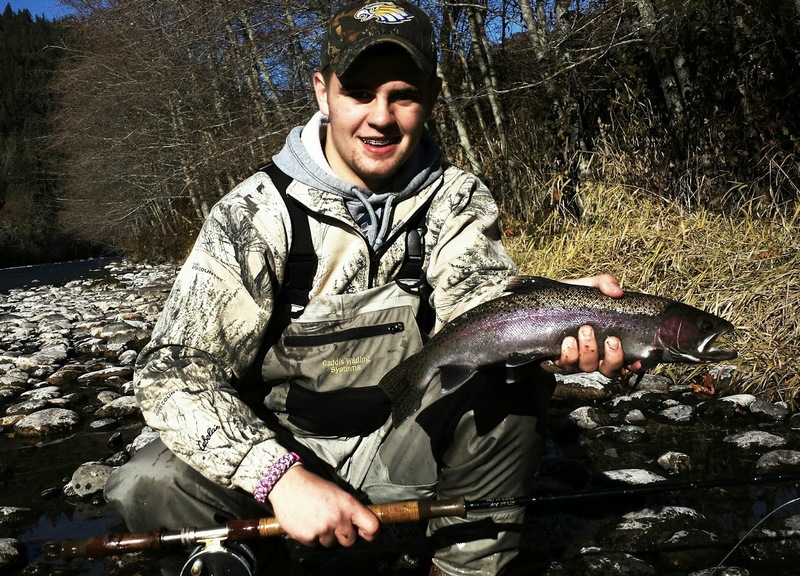 By the time I got back up the river he had the nice hatchery fish subdued. "Griller Dad, I told you I know where they are." Gage said when I got there. I took some pictures and congratulated him nonchalantly, but I couldn't be prouder as my son has turned into a steelheader, he is reading his own water and catching fish out of it. He went on to hook and a hog just a bit further down the run. I tied on a "prototype" and hooked a couple of my own but they didn't get me near as excited as Gage's! To say I am a proud papa is a understatement. Gage with a well read fish! A couple for the grill! Time for the big boys on the Rogue River! When temps drop in the low 20's in the Rogue Valley, and the days shorten, its time to pull out the big flies, and if its on the Rogue River it had better have black, orange, and blue. It should also have a bunch of movement and some flash to move cold water fish. 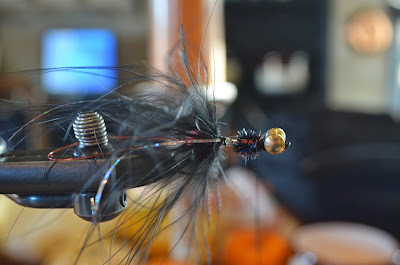 The perfect Rogue Cold Water swinging fly should poses all these things, That's what moved me to design Casey's Intruder. 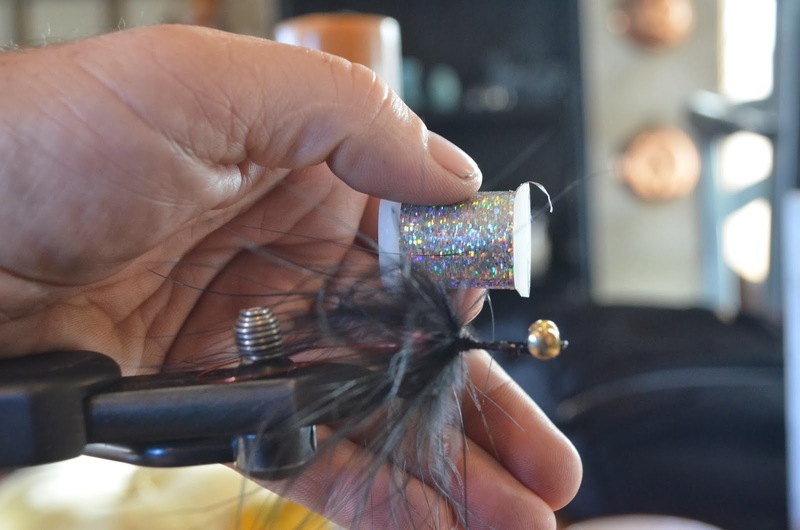 Named after one of my favorite cold water runs on the river, this fly contains everything the Rogue River Steelhead want. The next few photos will show you how to tie it. 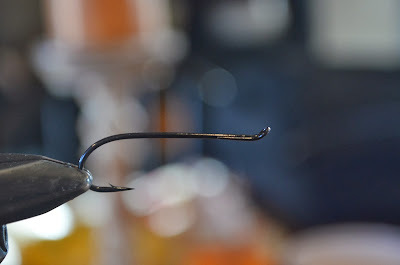 Start with a long shank hook. Get some Heavy Mono, I like colored just to add to the fly. 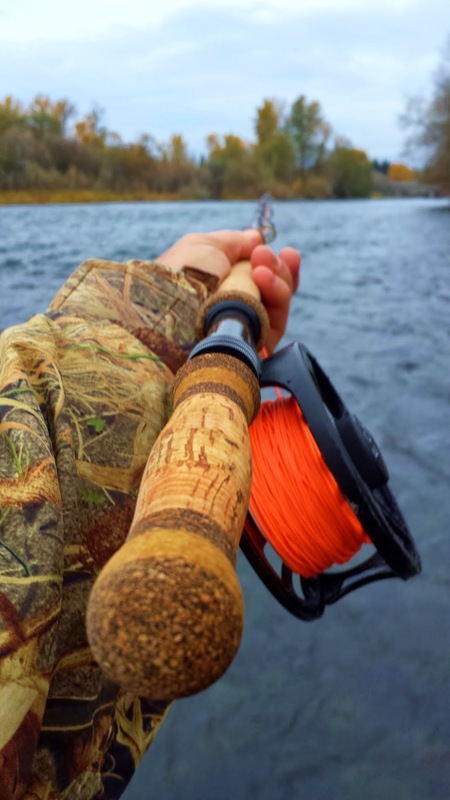 Start it through the eye of the hook. Make the loop go back to where the Marabou will flow--normally a couple of inches but, If you get a ton short strikes like the Rogue make a larger loop. 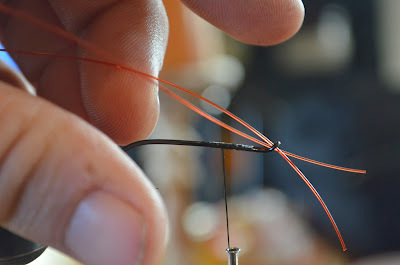 Fold the mono through and lash it down! Do a good job here as this is what will hold the fish. I also hit this with super glue. Install eyes and super glue them. Use orange chenille and make a ball. 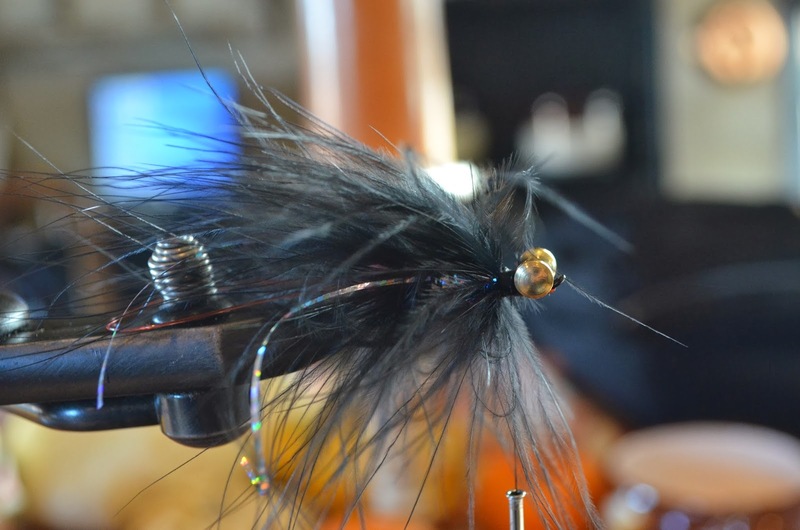 this ball will make the marabou loo like it has mass when the fly swim's. 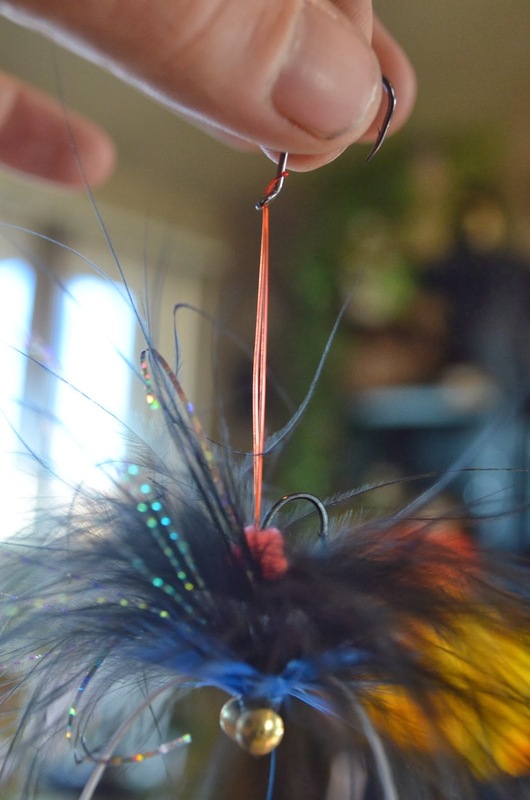 Tie in a marabou tip like a hackle. Add a couple of flash strips, I like holographic flash. Add a tinsel over-body advance you thread, and make another chenille ball. 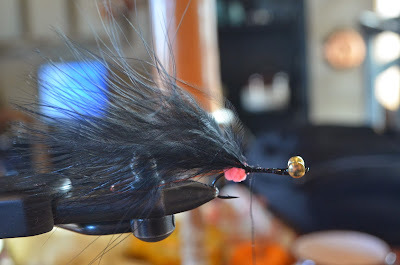 Add another marabou tip and wrap it like a hackle. Add four white rubber legs that do not go past the marabou in the swimming position. 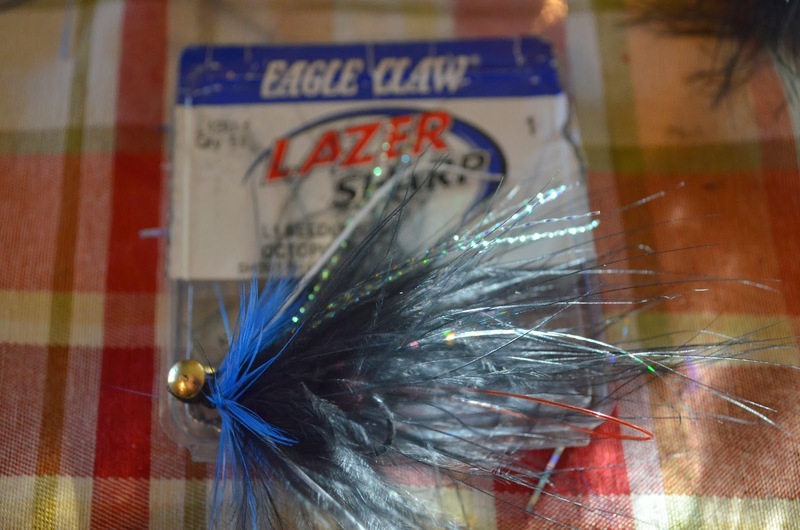 Add flash, and a blue hen hackle. 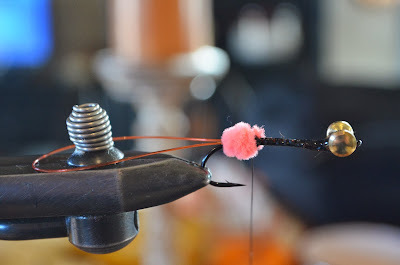 Whip finish and clip off the bend of the hook with diagonal cutters--this will keep the fly swimming right. Add a octopus hook to the mono. 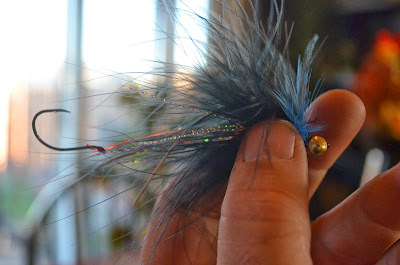 There it is, a fly to move cold water Rogue River Steelhead! Some of you might, or might not know, that I am close to the service as I am connected to it on several different levels. That is what drove me to help Big Stick Forums say thanks to America's Veterans. 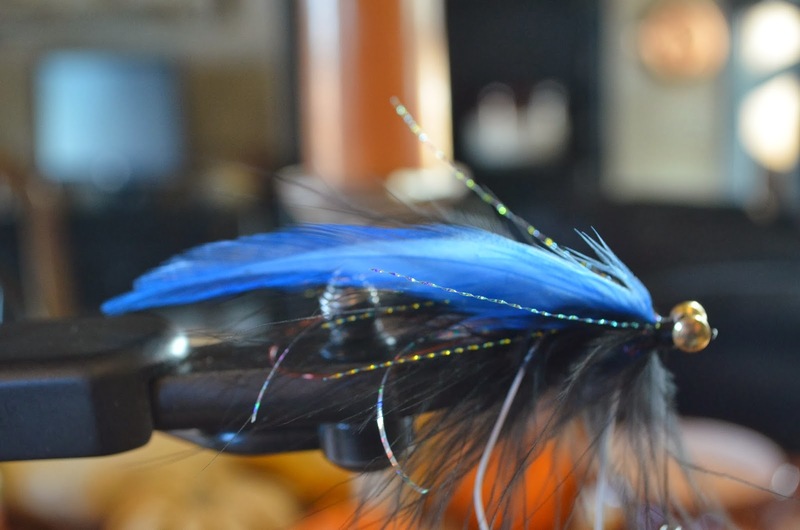 Big Stick Fly Fishing Forums is giving a project healing waters rod to Veterans with every 500 people who sign up, and I am giving away some free trips! Come, register at and Help the Vets! We Are a service oriented family. From left to right, Nathan Gage Bailey Sea Cadets, Chase Bailey future Cadet, Misty Bailey the General, Aaron Bailey/Adams Us Army MP, Nathan Bailey Us Air Guard F15 Mechanic. Hatch!! Sorry to make winter longer!! This will make you count the days to The Williamson River Hex Hatch! Labels: Big Fish Gulping Fat Flies! Check out my website and win free stuff! 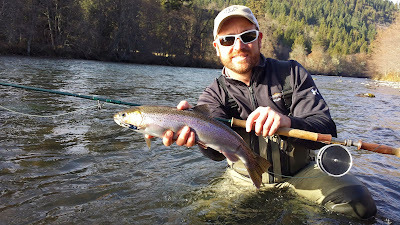 Hello all www.southernoregonflyfishing.com has just passed 1500 views. Once we hit 3000 views Im going to give away one of my favorite lines--the AirFlo Rage! here are the rules, once you view my website you have to click on the email link provided there and email me that you viewed it. Once we hit 3000 views I will take pull a name out of a hat from those emails. Pass the website around, the faster we hit 3000 the faster we chose a winner. The Rogue River Spey Fishing Is Back on! Last week consisted of praying for Rain!--the Rogue slowed the last couple weeks. 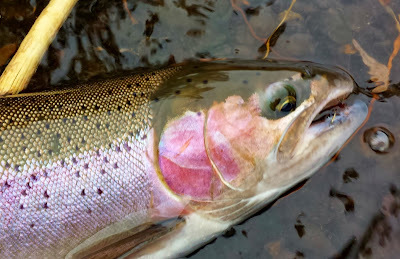 The Rain finally came, the River grabbed some color, and best of all, the Steelhead started biting again. I had some new lines to try out so I hit the river at about 3:30 this afternoon leaving me just a couple of hours to get my two new Tfo's dialed in! I started through the run with the TFO 4/5 126 4 DC. I lined it with a 330 grn Airflo Skandi compact, which was a tad on the heavy side, but I slowed the rod enough to let it do its thing. 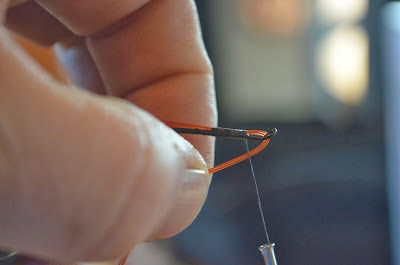 I tipped the head with a intermediate polly and about 3 foot of 0x tippet. I placed two prince Nymphs and dead drifted them in The greased line fashion of old. Even though the the flies bounced their way through the run the fish waited until they started to swing before he slammed them! The little Spey Rod did well, and 15 minutes later the 5 lb buck was in my hands. 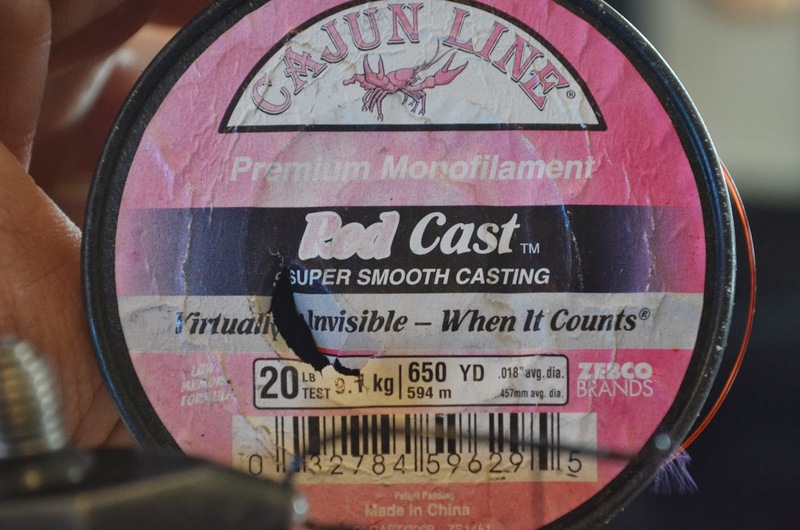 I loved casting the little rod, but Im going to buy a 300 grain scandi for touch and go casting. 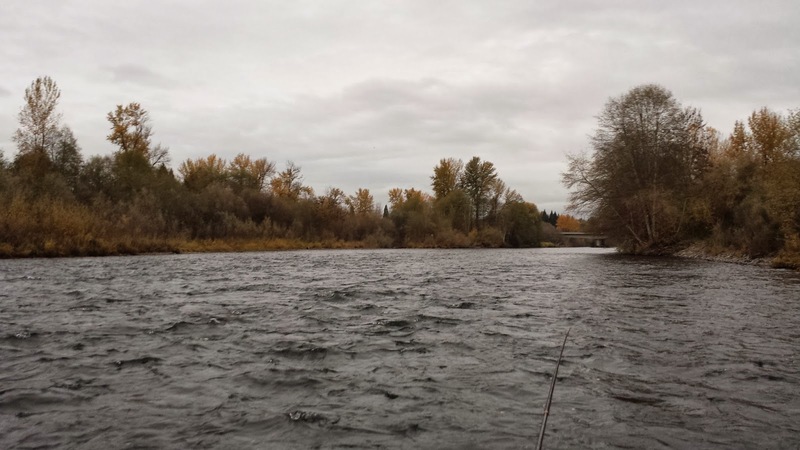 I really wanted to catch a fish on both rods as it was the first time they were out, and I knew it would put some serious Steelhead Mojo on them, if they hit fish. 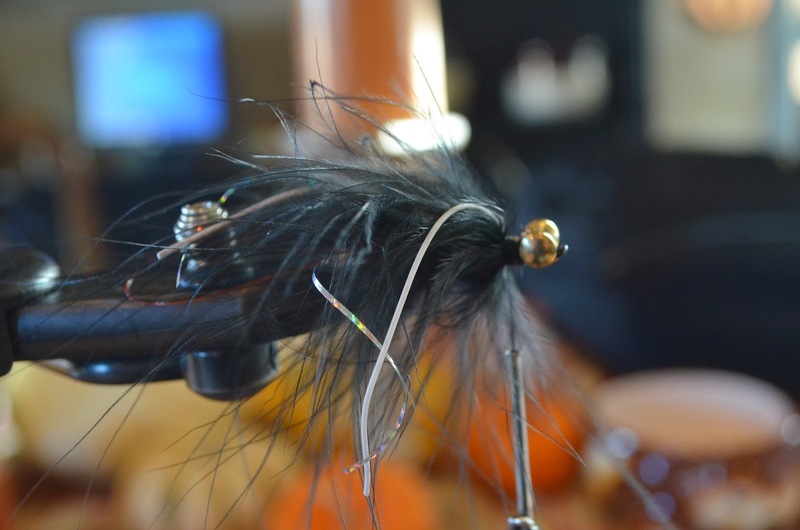 The next rod to Fish was the TFO TF 6/7 130 4 DC. This is the absolute best rod I have casted and fished, in a long time. I lined it with a 480 Airflo Skagit Intermediate and 10' of T7. The line swung slow and hung just off the bottom. This presentation brought a huge strike that jerked line off the reel. I felt the weight of the fish, but was unable to get a solid hookset. I fished until dark and had a couple small taps, but left the river with a huge Grin. 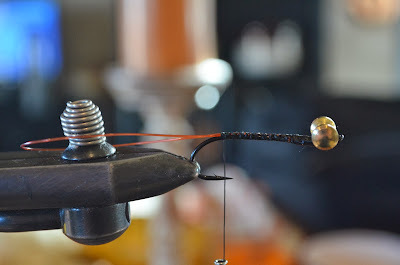 I love the rods, with a little more fine tuning they will become at the top of my list of great rods. Two Hours and a few fish, it sounds like the bite is back on boys--lets make up for some Lost Time. 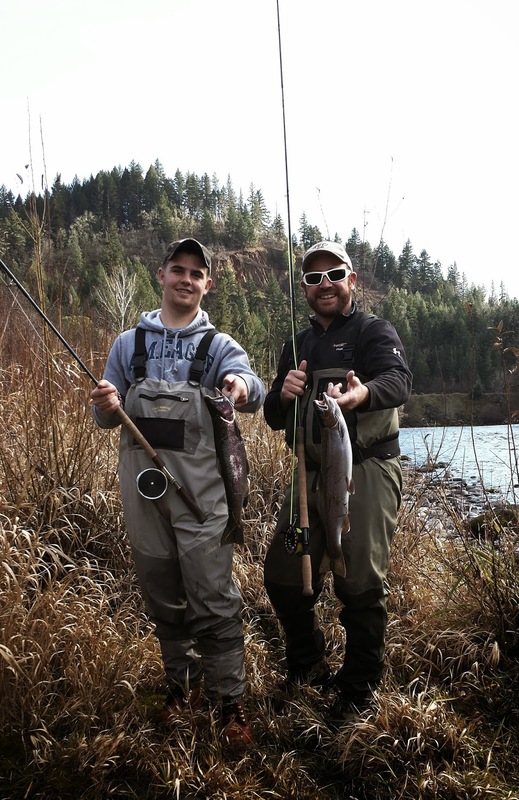 The 4wt Spey Rod did a great job on this Rogue River Steelhead ! The Rogue Is getting some color! This movie strikes to our core as fishermen/outdoorsmen I want to see it in the worse way. "A Deliberate Life" (Trailer) - Official Selection, IF4 2013 from IF4 on Vimeo. 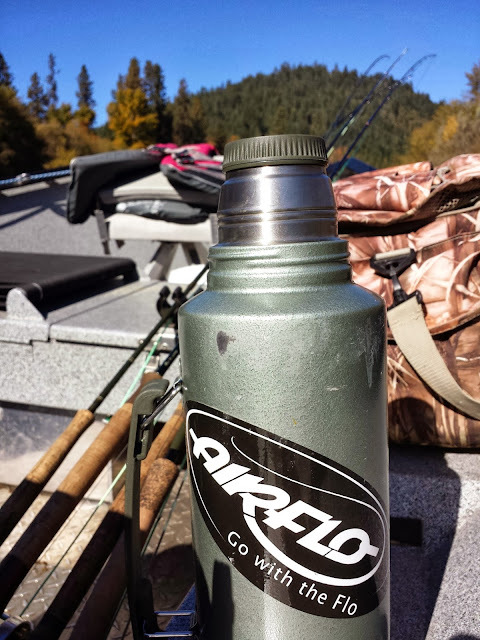 Labels: Fishing Life, Fly Fishing.